In addition to our usual roster of classes and lessons at our Francis Street building, this summer we hit the parks in a big way. 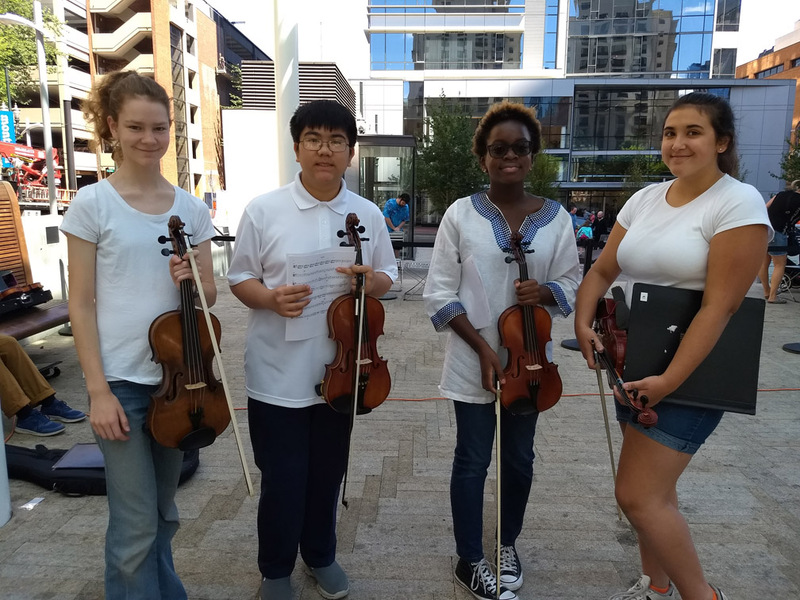 CMC's Summer Chamber Music program students performed in Director Park (downtown) in July, then again at the grand opening of Gateway Discovery Park on NE Halsey in August. Through the summer we gave over 400 free music lessons in violin, cello, trumpet, piano, and guitar in Parklane and Lincoln Parks (both East of I-205). Bravo to leader Brendan Rawlins, counselor Lupita Zamora (a CMC alum! ), instructors Zita Jefferson & Lisa Zweben, and intern instructor Byron Liang pictured here, plus teachers Brian Bennett, Jamie Chimchirian, and Joe Klause, and also to the folks in PP&R's Lunch & Play program - great partners & amazing workers who ensure that kids have a healthy lunches and wholesome activities all season long! We also completed our 2nd summer of free music lessons for East Portland youth at Rosewood Music Program. Our instructors gave weekly lessons in violin, cello, piano, flute, clarinet and saxophone to over 40 students. This fall we launch into our 2nd school year program of lessons at Rosewood and hope to add some classes as well. What began as an AmeriCorps project to organize neighbors in East County is now the Rosewood Initiative, a bustling non-profit public service center with dozens of community partners including SE Works, Human Solutions, and PP&R. 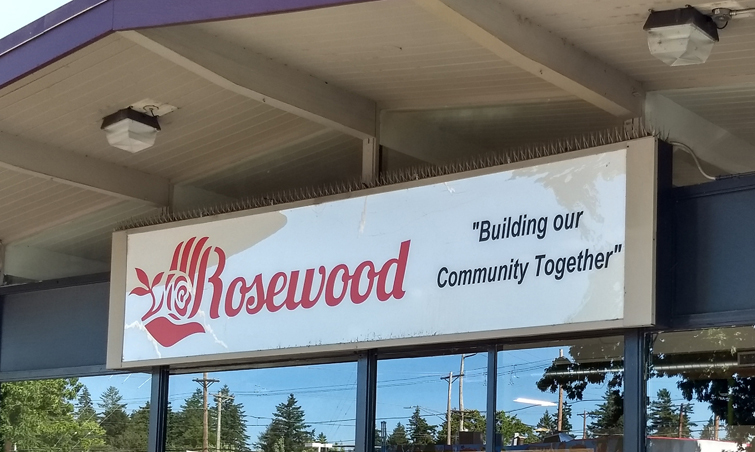 Rosewood maintains a busy calendar of events and cultural & educational activities for the local community. Located at the intersection of two school districts and on the border of two cities (Gresham & Portland), its newly renovated facilities at SE 162nd & Stark is a hub for events and social service information and resources for the area. Resources include a computer lab, bicycle repair, job training and placement and music room. 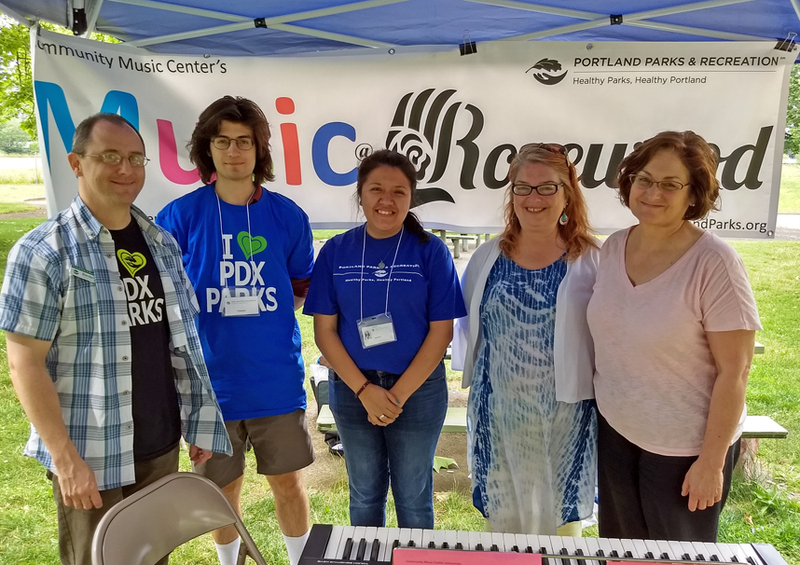 In 2016, PP&R received an innovation grant from the City of Portland to install a music room for the purposes of offering full-scholarship music lessons to youth at Rosewood. Lessons began in the summer of 2017, launching the Music at Rosewood program. Students gave their first recital the following June. The program also sponsored free mini-music lessons in parks near Rosewood in the summer of 2017 & 2018 in partnership with PP&R’s Free Lunch and Play program.